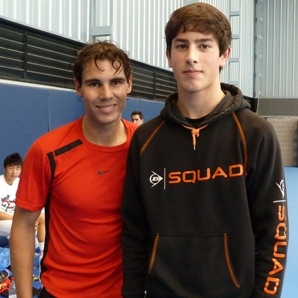 A prodigal young tennis player from Bracknell became the envy of friends and rivals alike when he was invited to meet and train alongside World No.1 Rafael Nadal. Elliot Dimmock, 16, from Warfield, has risen through the ranks of the junior game, and has even tested himself in a number of senior competitions over the last few months. The Ranelagh sixth former is currently ranked second in the UK at Under-16 level, 17th at Under-18 level, and is 163rd in the country in the senior game. The opportunity to meet Nadal came about after a chance meeting between Dimmock’s father, David, and Times tennis writer Neil Harman during a training session at Esporta Berkshire Health & Racquets Club on the Nine Mile Ride. A close confidant of Nadal’s, Harman spoke with the reigning Wimbledon champion’s uncle and coach, Toni Nadal, who managed to arrange the once-in-a-lifetime trip for Dimmock to attend the training base in Majorca. So, little over a month ago, Dimmock and his dad jetted out to the Balearic island where he spent a week training with the superstar ahead of Spain’s Davis Cup match with Belgium. Not only did the young player get to hit a few rallies with Nadal, but he also gained valuable experience of what life is like for a professional tennis player, filling him with ambition to go on and emulate his idol. “It was an amazing and unique experience,” said Dimmock. “On the first day we were picked up from our hotel and taken to what looked like an aircraft hangar with one fantastic acrylic court in the centre. “I then met Rafa and were quickly welcomed into the inner sanctum of the camp – he is a very approachable down-to-earth person. “Watching Rafa at work is something very, very special. “I was fortunate enough to hit with Rafa on several occasions, fulfilling a lifetime dream. “It was an awesome feeling – he has a forehand like a missile and he doesn’t know what less than 100 per cent means. “Watching him hit the ball with such ferocity is something quite extraordinary and astounding – there is a very good reason why he is the number-one player in the world. “I was slightly nervous to start with, but I soon managed to get into a rhythm and hold my own for a good half an hour. During their week in Majorca, Dimmock also had a preview of the type of gruelling fitness regime a professional tennis player abides by, as well as the rewards a life at the pinnacle of the sport can bring. He had his picture taken alongside Nadal’s brand new 190mph Aston Martin DBS, while he also managed to see two of his multi-million-euro seafront homes. And they even spoke to Nadal about his plans when he retires from the tour – establishing sports academies across the world, not only catering for tennis, but also some of Nadal’s other passions, such as basketball and football. And the experience has given 6ft 4ins Dimmock renewed vigour and motivation to go on and achieve his goals. “I chatted to Rafa about his love for football and I was surprised to hear him say, with all sincerity, that he genuinely prefers football to tennis,” he said. “He believes that the secret to success is not doing the same as everyone else – you must do things differently or you just become the same as everyone else. “It has really inspired and motivated me. “I’m a lot more focused now and a lot more willing to put the hard work into my training. “I now need to get into as many tournaments as I can and the goal for the time being is to get to Junior Wimbledon. And who knows, if he continues to progress as he has, then in a few years time it could be the young players of the future traveling to meet Bracknell’s own Elliot Dimmock for inspiration of their own.